Thames Estuary and Marshes SPA is primarily located on the south shore of the outer Thames Estuary, although it also encompasses a small area of the north shore, and covers an area of 48.39 km2. Extending for approximately 15 km along the shores of the estuary, the site comprises of extensive areas of grazing marsh as well as flooded clay and chalk pits (JNCC, 2015). The site provides wintering and breeding habitats for important assemblages of wetland bird species, as well as supporting migratory birds on passage. 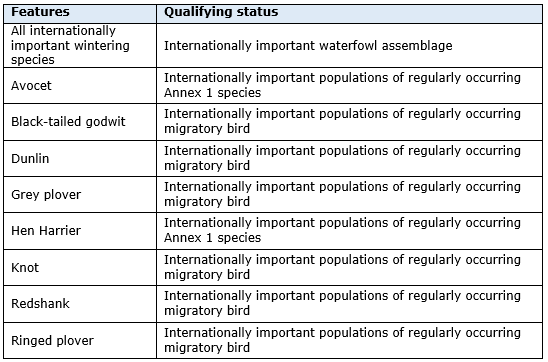 Over winter, the area regularly supports 75,019 individual waterfowl (4 year peak mean 1993/4 – 1997/8) including: Dunlin, Ringed Plover, Knot and Grey Plover (JNCC, 2015). – The distribution of the qualifying features within the site. 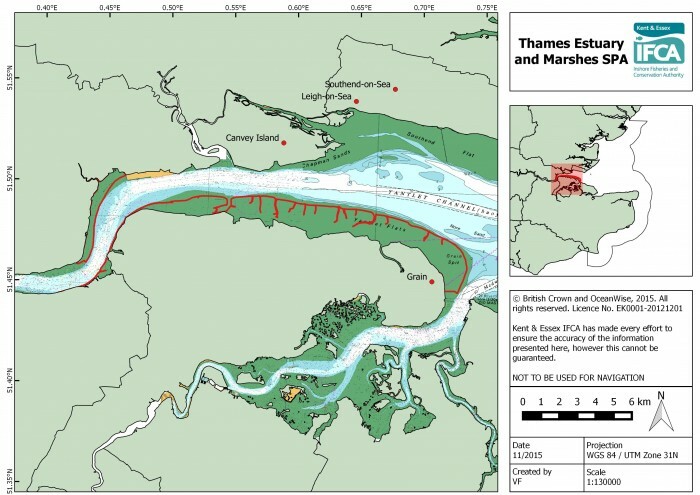 Thames Estuary and Marshes SPA is in the intertidal areas in the south of the Thames estuary, one of the busiest estuaries in the world which hosts an extensive range of activities. Offshore development construction, marine aggregates extraction, capital and maintenance dredging of shipping channels, commercial fishing, recreational activities and sites of conservation importance all co-habit within a short distance of this site. A number of active fishing ports are also present nearby including Leigh-on-sea and Queenborough. Fishing activities undertaken in this site are small scale and mainly focus on fixed and drift netting as well as whelk potting. On occasion some low level cockle suction dredging also occurs, and this is highly managed under the Thames Estuary Cockle Fishery Order 1994. KEIFCA is responsible for assessing the effects of commercial fishing within this site and must implement appropriate conservation measures to avoid damage to EMS by fisheries activities. In addition to assessing the site and creating management plans, KEIFCA is also responsible for the enforcement of fisheries byelaws and regulations within this site.